The few regular readers of these pages are aware that I’m working on revising some old work on the vocabulary of First Timothy and incorporating new work on the balance of the Pastoral Epistles. Here’s an excerpt on the phrase “husband of one wife” found in 1 Tim 3:2. Many debates on the role of women in the fellowship have turned on this one phrase. 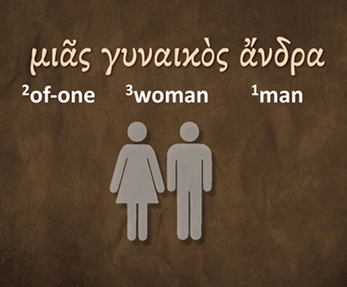 The phrase in the Greek is simple; it is the words for “one”, “woman” and “man” (in that order). The words for “one” (εἷς) and “woman” (γυνή) agree in case, number, and gender. The word translated “man” is ἀνήρ, which most generically represents an adult male. This has led many to translate this phrase in a substitutionary manner as “a one-woman man”. As is the case with many simple and seemingly literal interpretations, there is more to this situation than meets the eye. The word γυνή, in some contexts, also indicates ‘wife’. The same is true for ἀνήρ, which may indicate ‘husband’. The words ἀνήρ and γυνή occur frequently in the New Testament and are translated various ways, according to context. When both of these words occur together, and when both are singular nouns the context is usually that of marriage. Here the opposite relationship, “the wife of one husband”, is stated as the discussion is concerning widows. The phrase, both in 1 Tim. 3:2 and 5:9, is not formulaic or aphoristic, but changes form to emphasize the primary member in the relationship under discussion. In 1 Tim 5:9, the primary subject is the widow, who is also the wife. In 1 Tim 3:2, the primary subject is the overseer, who is also the husband. The case is genitive, the number is singular and the gender is feminine. BDAG, p. 208. Occurs 215x in NT. BDAG, p. 79. Occurs 216x in NT. 27 verses: Mk 10.2; Lu 16.18; Jn 4.17; Ac 5.1; Ro 7.2; 1Co 7.2, 3, 4, 10, 11, 13, 14, 16, 34, 39; 11.3, 7, 8, 9, 11, 12; Eph 5.23, 33; 1Ti 2.12; 3.2; 5.9; Tt 1.6. It is questionable whether 1Ti 2.12 is in the context of marriage, though it is quite possible.